Or a better way of putting it, usually it's either feast or famine, and boy I'm stuffed. After weeks of a few things here-and-there; this morning was a deluge of good buys at cheap prices. First, I found the Trans World Entertainment clamshell of T.Y. Drake's The Keeper starring Christopher Lee and a sealed Destroyer with Lyle Alzado and Anthony Perkins amongst Pokemon tapes. 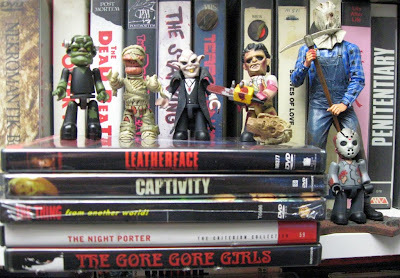 Then I find mint copies of Criterion's The Night Porter, Image's The Gore Gore Girls, Warner's The Thing from Another World, Lionsgate's Captivity (yep, I'm not proud), and New Line's Leatherface for a measly seven dollar bills. As I'm nearing the end of one swap meet, I run across Anchor Bay's CE VHS of Spider Baby and another TWE clamshell of the awesomely idiotic Fred Olen Ray actioner Commando Squad (my old thoughts here). 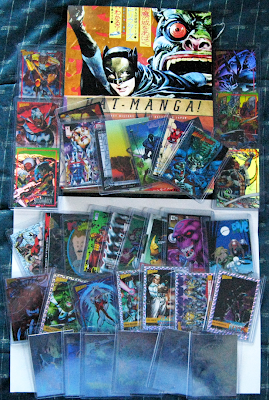 As I'm driving down to another swap meet, I crush the brakes upon seeing a front yard lined with colorful packaged goods, which usually means comics and other junk that make me nerd out. To be honest, I'm not the biggest hoarder of comics, I usually only sloppily look through boxes for select stuff (i. e. - horror related) or if presented with the chance grab cheap bundles. Though I do have a thing for non-sport chase cards, I collected them like crazy when I was a kid, and I snagged a slew of bagged and tagged ones for a song. I also ran across a copy of Bat Manga! The Secret History of Batman in Japan by Chip Kidd and Saul Ferris. An overwhelmingly colorful book collecting and translating unique, vintage Japanese Batman comics by Jiro Kuwata on artificially dilapidated paper stock. First time I ran across this, but once I thumbed through the pages it was an instant purchase. Last but not least, my final stop yielded a couple little Mezco Mez-Itzs of Nosferatu, The Mummy, Frankenstein, Leatherface, and Jason. Then I find NECA's Friday the 13th Part 2 Jason action figure, incomplete, but only for a buck. Old Wizard cards! Nice... and hologgraphics... sweet. Man. You know, back home I've got all sorts of stuff you've got pictured. A lot of rare holo cards from Spiderman and X-Men, also B&B, some Wizards, 94 Flair (Damn near the whole set! ), Lady Death, Garbage Pail Kids, ect. Just today I bought three packs of the new GPK flashback packs at 2$ each. Radness. AWESOME HAUL!! !I especially love the Kubricks!